Smile! Today is Better Than Yesterday. #ElectionResults2018? So: what happened yesterday with the #ElectionResults2018? You’re going to hear “there was no blue wave.” You’re going to hear election results “vindicate” the bullying, partisanship, and nationalist hate you’ve experienced for almost two years. Here’s the truth: all the peacock strutting in the world can’t get back what the current GOP just lost… and it was a lot, nationally and locally. The democratic republic worked as it should. Checks and balances have been reestablished as House committees that refused to provide oversight have new leadership. Over 100 women won elections yesterday, so there’s new and younger idealistic representation in place. It took everything the GOP admin had to hold onto the Senate when they saw the House was lost. Corporate Cruz had to kiss Donnie’s ring to barely beat Beto’s grass-roots campaign in Texas. Kim Davis was ousted by the man she wouldn’t give a marriage license to. Oh, and a Nevada brothel owner and reality TV star who *died* last month has won a heavily GOP state legislative district. Smile! Today is better than yesterday. Bob Mueller is waiting to press send. Follow me - get extras FREE! Enter your email address to get notifications of posts from Kevin A. Ranson and access to special subscriber content. Subscribe for Email & Author Extras today! AuntieMaim.com - the author website of Linda S. Cowden, official site for Grimmie, a novel of the Grim Reaper. CedarcrestSanctum.com - a rest home in central WV where no one dies. Home of The Matriarch, a vampire novel series. MovieCrypt.com - A film lover's review of all genres of movies. Recent movie reviews, Reaper rants videos hosted by Grim D.
SpookyChronicles.com - Meet Spooky, a dead boy growing up in a tourist trap town. 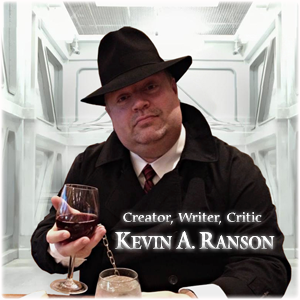 ThinkingSkull.com - the author website of Kevin A. Ranson: media creator, horror writer, and film critic.